I'd like to tell you a little about the five men who died. "On Friday, August 28, 1908 the villagers of East Ardsley were in mourning. Just before 10am at the village's iron works, five men died and 13 were injured when the bell of the number one furnace exploded and fell onto the engine house, resulting in hot iron raining down on the workmen. Two local men, David Nicholson and William Keenan, were killed instantly. The explosion caused a stream of molten metal to pour down in front of the furnace, seriously injuring a number of men. They scarcely had any warning and it seemed too late to reach safety, their only means of escape was to crawl on hands and knees over the red hot coke and ironstone. Ambulance men from the Great Northern Railway depot close by were quickly at the scene and the injured were taken by train to Leeds Infirmary. An account given by those first at the scene said that William Keenan must have realised that an explosion was inevitable as he was discovered with his arms still shielding his face. David Nicholson's injuries were so severe that his body could only be identified by a new pair of boots he was wearing. The injured Arthur Tyldesley said that just before the explosion he had left one of the furnaces and was in the number one weigh cabin when he heard a "terrific crack". He looked out and a lump of something red hot hit him on the head, splitting it open. He said: "There was coke and metal flying around everywhere. On my hands and knees I crawled over the red hot metal and took shelter under a coke wagon." The inquest into the deaths of Mr Nicholson and Mr Keenan was opened two days later by county coroner, Mr P Maitland, at the Great Northern Railway Hotel in the village. During the inquest, the works' assistant manager Mr Thomas Hoskinson gave a demonstration of how the furnace worked, explaining to the jury that the number one furnace, where the blast occurred, was 75ft high and was filled with material - lime, ironstone and coke. He said that the furnaces were liable to explode when there was a mixture of gas and air and the 'bell' kept out the air. But if the material was to fall suddenly then some of the air could escape into the upper part of the furnace without being converted into gas. "That's the only cause which is likely to produce an explosion," he said, adding that the furnace, built in 1902, was relatively new and the men had never complained about its workings. 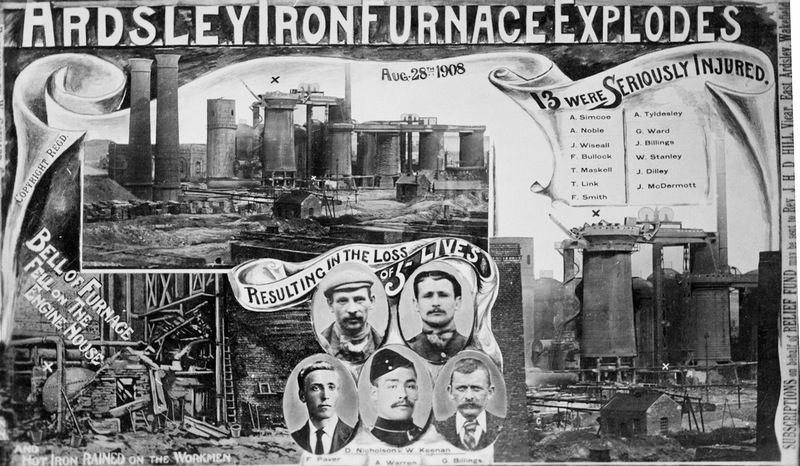 An expert theory, given by Mr A S Keith, assistant works manager at the Leeds Steel Works, said: "The cause of the explosion was due to the taking off of the blast to 'check' the furnace, which caused a slight vacuum and therefore reversed the action of gases. Because of this an explosion takes place." He added that more than 200 tonnes of material must have been blown out. The jury took just 20 minutes to reach a verdict that: "The two men were killed by shock by an accidental explosion at the furnace." Another inquest was held afterwards following the deaths of Alfred Warren, George Billings and Fred Paver, at Leeds Infirmary. The same verdict was recorded. Just two days after the explosion, East Ardsley was a scene of mourning when crowds of sympathisers packed out the village for the funerals of David Nicholson and William Keenan. It was seen as appropriate that the men should be laid to rest side-by-side." Let's begin to remember each of the men who died. David Nicholson was 39 years old and living at 13 Bright Street, The Falls, East Ardsley. He died at the scene and, at the inquest, his body was identified by his wife, Rose Nicholson. He was buried at East Ardsley St Michael on 31 August 1908. David was born in Eyeworth in Bedfordshire in 1869. His father, George, was an agricultural labourer and his mother was Eliza (Medlock). In 1871, he is living in High Road, Eyeworth, with his parents and three siblings. Ten years later he, his father and five siblings are living in a Cottage on the Road in Eyeworth, but earlier that year his mother had died, and his father has married Susannah Gentle. By 1891, David is living with his brother Charles' family at 14 Allison's Buildings, East Ardsley. Both brothers are furnace labourers. Allison's Buildings were in the area at the lower end of Common Lane just below the Iron Works. The following year, David married Rose Jarvis, and by 1901 they are in Allison's Buildings with their four children - Lucy 7, Florence 6, Anne E 3, and William Henry 1. Lucy and her mother, Rose, had been baptised at East Ardsley St Michael on 14 August 1894, and Florence and William Henry were baptised at St Michael's on 9 August 1900. In 1908, daughter Elsie was born - and she was baptised at St Michael's only two days before her father would die in the explosion. It follows, then that at the time of David's death, Rose was left with five children; from baby, Elsie, who was only a few weeks old, to Lucy who was 14. If we move on to 1911 - three years after David's death - widow, Rose, and those five children are living at 28 Oxford Street, East Ardsley. William Keenan was also 39 years old and living at Allison's Buildings, East Ardsley. He died at the scene and, at the inquest, his body was identified by his wife, Theresa Keenan. William was born in Cockermouth, Cumberland but by 1871 is living in East Ardsley with his parents, Daniel, a coal pit labourer from Ireland, and his mother, Catherine from Whitehaven, and two brothers. In 1890 William married Theresa Ellen Bateson and, the following year, they are living at 1 Old Lane, East Ardsley. By 1901, they are at Ross Terrace in the Main Street area of the village - what you will know as being opposite the Recreation Ground - and have four children - Catherine 6, James 4, Margaret 2 and Sarah, who is eight months old. Another daughter, Rose, would follow in 1903. So, at the time of William's death, Theresa was left with five children whose ages ranged from five to thirteen. Moving on to 1911 - three years after William's death - widow, Theresa, and those five children are living at 27 Low Mill Street, Addingham. Alfred Warren was 28 years old and living in Woodhouse Lane, East Ardsley. He was injured in the explosion and died later in Leeds General Infirmary. At the inquest, his body was identified by his wife, Lily Florence Warren. He was buried at East Ardsley St Michael on 3 September 1908. Alfred married Lily Florence Warren - yes, same maiden surname - at Wortley St John the Evangelist in Leeds on 8 April 1905. They were both living at 23 Highfield Crescent, Wortley at the time. Daughter, Gladys, was born on 9 May 1908 - just over three months before her father, Alfred, would die in the explosion. In 1911, Lily and Gladys, now 3, are living at 12 Amberley Road, Wortley, Leeds. Fred Paver was 26 and living In Abson's Buildings on Pawson Street, The Falls, East Ardsley. He was injured in the explosion and died in Leeds General Infirmary about midnight on 30 August 1908. At the inquest, his body was identified by his wife, Elmina Paver. In 1891, Fred was born in Warmfield but by 1891 he is with his mother, Emma, and four younger siblings in Lawns Terrace, East Ardsley. In 1901, Elmina Dunham is living in Allison's Buildings. On 30 September 1905, Fred married Elmina at East Ardsley St Michael. When Fred died, Elmina is left with two young sons - Paul, who is less than three years old, having been born in 1906 and baptised at St Michael's on 1 July that year while his parents were at Allison's Buildings, and Ralph who is only months old, having been born in 1908 and baptised at St Michael's on 12 March of that year, five months before his father's death, while his parents were living at Arnold's Buildings, The Falls, East Ardsley. By 1911, Elmina is a domestic servant to Joe Clayton, a master printer and lithographer at 18 Bond Street, Wakefield - and her sons, Paul and Ralph, are living with their grandparents (Elmina's parents) at 8 Stanhope Grove, Thorpe. George Billing(s) was 49 and living on Crofton Terrace, Wide Lane, Morley. At the inquest, his body was identified by his daughter, May Amelia Livsey. George was from Kettering, Northamptonshire, where his father was an agricultural labourer. George married Mary Elizabeth West at Thrapston in Northamptonshire in October 1882, and daughter May Amelia was born in 1884. Her mother, Mary Elizabeth, died in 1908 - so by the time daughter, May Amelia, identified her father's body, she would be mourning the loss of both her parents during 1908. May Amelia had married Thomas Hinsley Livsey of Lawefield Lane, Wakefield at East Ardsley St Michael on 3 October 1904 when she was at 24 Garden Street, Wakefield and they moved to 38 Garden Street. In 1911, Thomas Hinsley and May Amelia are still at 38 Garden Street with three of May Amelia's younger siblings. The couple have had three children during their six years of marriage - but, sadly, none of them have survived. David Nicholson, William Keenan, Alfred Warren, Fred Paver and George Billing. They deserve to be remembered - today, and every day. Story researched and told by David Simmonds.